There's a bewildering variety of tripods and heads. Michael and Diane studied and tested them with various spotting scopes to determine what are good combinations for serious birders. Here are some outstanding choices. Feel free to give us a call at 800-779-7256. You can also order online at the Birdwatching Dot Com Store. Efficient, high-quality tripod kit for any birding scope. The most economical tripod to do the job. The Manfrotto MT190X3 is our top choice in an aluminum tripod for spotting scopes. New in 2014. The Manfrotto 128RC Fluid Head pans and tilts smoothly. Free shipping to US 48 States. The Manfrotto carbon fiber tripod is lighter weight but less costly than Gitzo carbon fiber tripods. The Manfrotto MT190CXPRO3 brings carbon fiber technology at an affordable price. New in 2014. The Manfrotto 128RC is our best-selling tripod head. 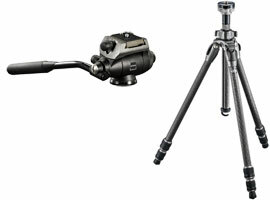 The Manfrotto carbon fiber tripod is paired with a Gitzo head designed especially for birders. Gitzo Series 2 GH2720QR "Birding Head" is the premier tripod head. Great for smaller scopes. Pack this in your carry-on bag! Tripod folds to a mere 16.73 inches. Gitzo Counterbalance G2180 head weighs only 1.2 lb. Removable handle.The whole kit weighs only 3.4 lbs. Superb lightweight tripod kit will work even with an 80 or 85 mm scope. The Gitzo GT1532 Series 1 carbon fiber tripod legs combine strength with light weight. Gitzo G2180 Counterbalance Head is tiny but has exceptional smoothness of operation. CLOSEOUT (while stock lasts) — Super bargain on a high-end Gitzo carbon fiber tripod and Manfrotto fluid head to use from a seated position. This Gitzo GT0532 Series 9 tripod is too short for some adults to use with a scope. The extended length is 55 inches. However, it is excellent for use while seated, or for a child. Gitzo G2180 Counterbalance Head is tiny and lightweight but has exceptional smoothness of operation. While stock remains. Free shipping to US 48 States.